My second cardigan has been completed successfully. Knitting this a second time in a larger size made for an easy project. I have come to know this pattern quite well and I do love it tremendously. 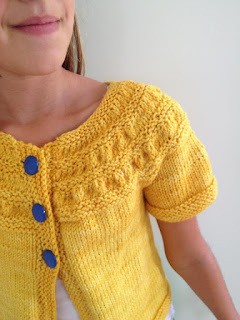 An easy knit with great yarn. I thought these sweaters would be hard to tote around but actually they have been very portable. I made a big effort to get this sweater complete in time for Leah's birthday. The sweater itself was easy finding buttons for her was harder than expected. In my mind I thought a nice ivory white color button would be the perfect fit.....but that was not possible. We sorted through hundreds of buttons searching for the perfect color and size. We found many great options that would have been beautiful. There were minor problems with sizing and lack of threes. This sweater's pattern calls for two buttons. After consulting with Leah she asked for three button holes. Finding three matching buttons in an assortment of vintage buttons was much harder than I expected. At first she didn't think the blue buttons were for her. She had her mind set on white. After placing different buttons on the sweater she realized that the blue really made a difference. That extra pop of color made the sweater more personalized. More Leah. Once she agreed to the blue buttons I let the sweater set a day just to make certain. When there were no changes requested I began to sew on the pretty blue buttons. Even though she had seen the sweater many times I still wrapped it up for her birthday. 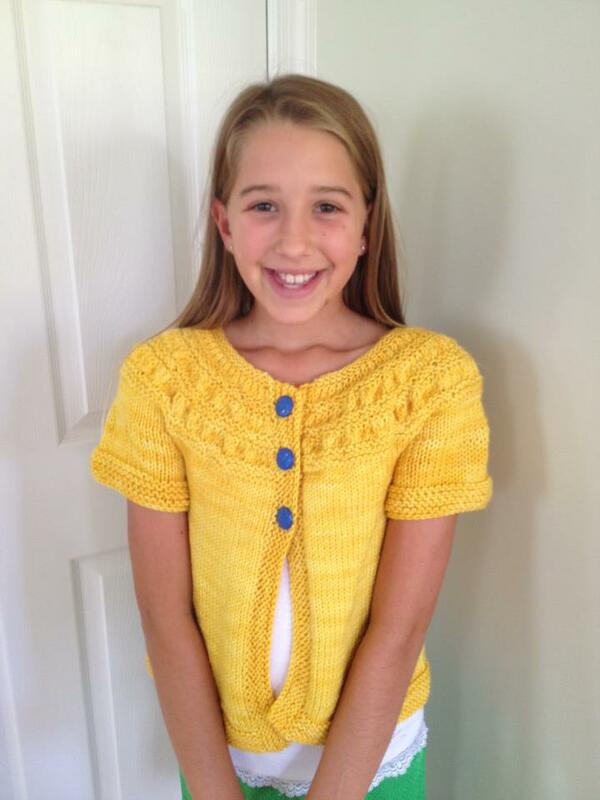 I think she is very pleased with the finished cardigan. It looks like it was meant for her, don't you think? I do. Yellow is her color.